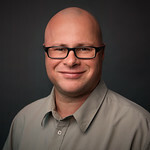 This post is a transcript of an internal post I did on Innoveo Solutions internal blog. Thanks to Innoveo to let me share this here! Skye Editor is our metal model editor which is written in C# 4, WPF uses Model-View-ViewModel design pattern and MVVM Light. The post shows the usage of JetBrains dotTace to optimize Skye Editor and the importance of profiling your code, here it is. The results are quite awesome! Here I am comparing the last version of Skye Editor which we shipped, 2.18 to the version currently in development for the next release 2.21. 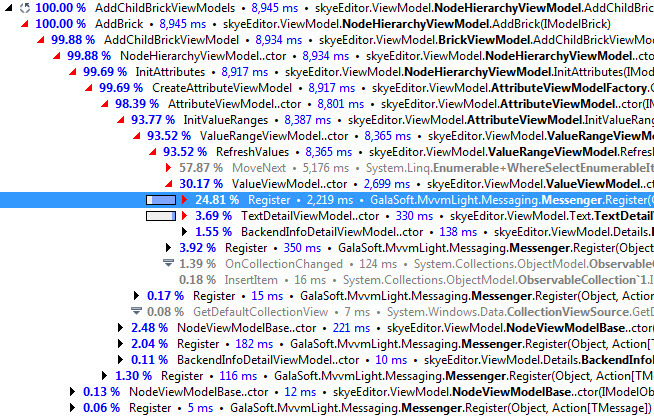 I used the profiler dotTrace from JetBrains to measure the performance improvement. Here is a first result for the method ActualizeFromNewArchive, which is used when we load, import or activate a definition. This method is responsible of building all the View Models used in the editor which we use to display the tree of root, brick, the attributes, value range, values but also the backendinfo.. and finally the texts. So on big definition there is a lot to create especially for the texts. So we went from 9083ms to 944ms which is around a 9.6 factor improvement as we can see on the following picture! That’s quite impressive. But where does it come from? Let dig deeper in the execution tree. So the first improvement is due an improvement done on MVVM Light 4 RTM a library we are using from the beginning which lets us decouple our View Models / Views using some messaging mechanisms among other features. I helped it’s author Laurent Bugnion to test and to improve the toolkit, he even mention us on MVVM Light 4 RTM. The improvement there is that CleanupList is not anymore done at that moment but only when the application is idle. Clever. And what is really cool is that I mentioned that performance issue and Laurent fixed it in the next release. Thanks Laurent! But this is not all because we have won only 3072ms which doesn’t bring us from 9083ms to 944ms. The other big improvement is the optimization of the way we find value which as radically changed. From 5103ms to 13ms ! The huge difference between those two methods is that the 2.18 is using a list and LINQ to find the first value which match the uuid we are searching. When the 2.21 is using a dictionary which index all values by uuid. This one make two access to the dictionary and the other only one access, which improved also quite a bit. Another improvement is that we removed the usage of a ThreadSafeObservableCollection which was dispatching to the UI thread all operations. Basically you could operate the collection from a background thread while it was bound to the UI, which normally you cannot do due to thread affinity, except if you dispatch, which for sure as a cost. So that’s it for the improvement when we load/import/activate a definition! It would be nice to have this gain but in fact we had to refactor the operation so that one part is executed on the UI thread on the other part on a background thread. So basically what touch to the View Model is executed into the UI thread and what touch the Model on the background thread. This can be again improved a lot because currently we have to traverse the whole tree and count all the relations to the texts we want to delete which is accounting for 19468ms. With a cache of relation it will much much faster. But that for next time! 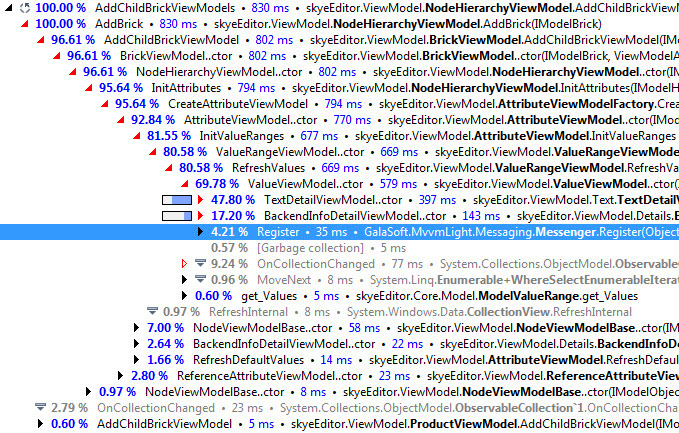 I hope you will enjoy the time saving of all those optimizations in Skye Editor!